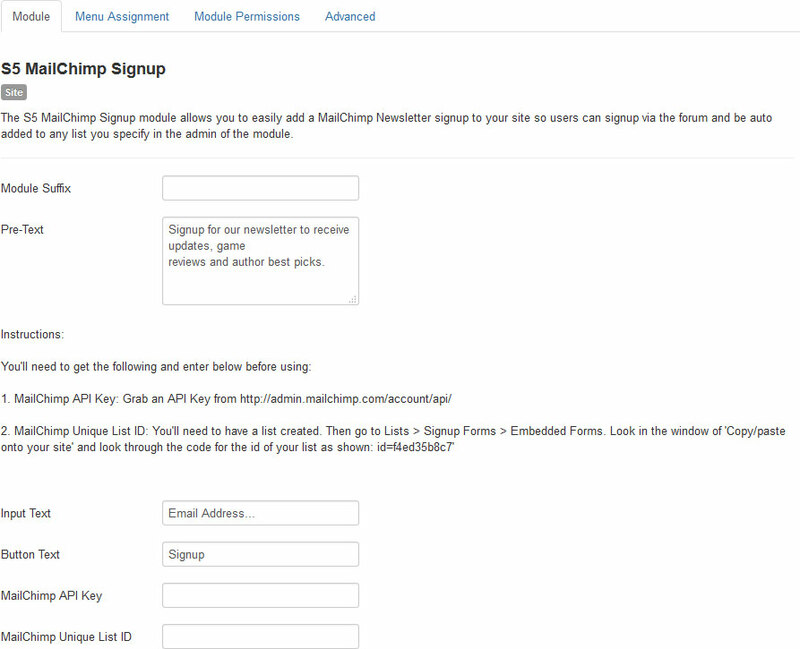 This tutorial will explain how to install and configure the S5 MailChimp Signup module. This module is AJAX powered and allows your users to instantly signup and get added to your MailChimp list that you specify in the module admin. All you need to do is enter your MailChimp API Key and Unique List ID. Note - Many of our club products contain specific styling for our extensions. These styles cannot be transferred from one product to another; they are integrated into the design. The same extension is used on all installations, the themes themselves contain the styling overrides. If a particular theme does not include unique styling for a particular extension, then the default style is used. Be sure to read the tooltips and other descriptions in the backend of this extension. There are a lot of tips and further information found in these areas. The first thing you'll need to do is install the module. Once you have it downloaded it just follow the below tutorial if you need help installing the module into Joomla. Refer to your template's module layout to determine the best position to publish this module to, this module is typically published to the "search" position on Shape5 templates. Enter your MailChimp account setting towards the bottom of the configuration screen. Enter your MailChimp Unique List ID. In Mailchimp to: Lists > Signup Forms > Embedded Forms. Look in the window of 'Copy/paste onto your site' and look through the code for the id of your list as shown. Configure any other module options as needed, such as pre-text.